Figure 1: The Collection panel, which is organized by subject using Collection Sets, e.g., Catalog Cleanup, Projects, etc. The seventh step follows the third and sixth steps: Use collections to keep track of images for projects. Assuming you are storing your images by date and location, as discussed in a previous post, and consistently keywording your images, as discussed in the last post, finding all your images of a specific event or your dog should be quick and easy. However, it gets more complicated as soon as you start working on a project and, while you can easily find numerous images of your dog, you most likely want to identify a subset of those images and keep track of them regardless of what folder they are located in on the hard drive. In the days before Lightroom, we would take out a piece of paper and write down the names of the files that we wanted to use for a project or, even more confusing but less time consuming, create a second copy of the images in a new folder. 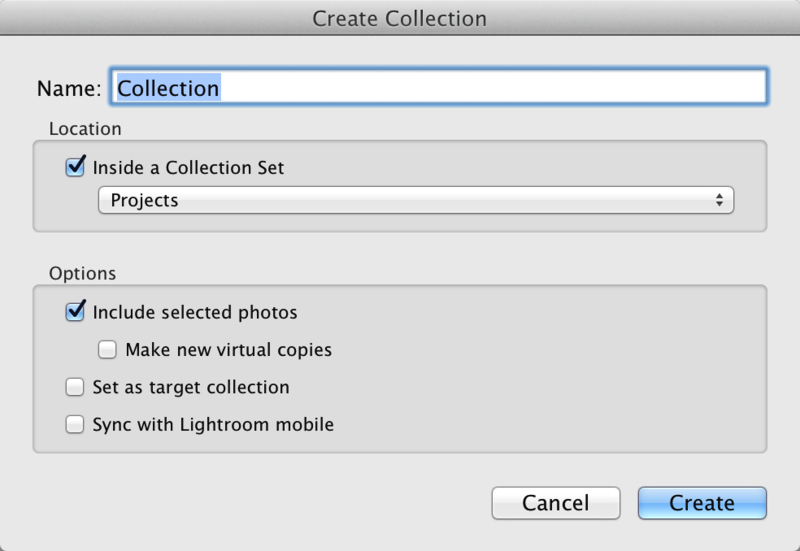 A collection in Lightroom is similar to that piece of paper but much more powerful. You can add images to a collection and subtract images; with a piece of paper, you would have added an image to the bottom of the list and simply scratched through a file on the list to remove it. However, unlike with a piece of paper, you can display and work on the images in a collection by simply highlighting the collection in the Collection panel. The paper approach required searching for each individual image every time it needed to be edited or used in the project. 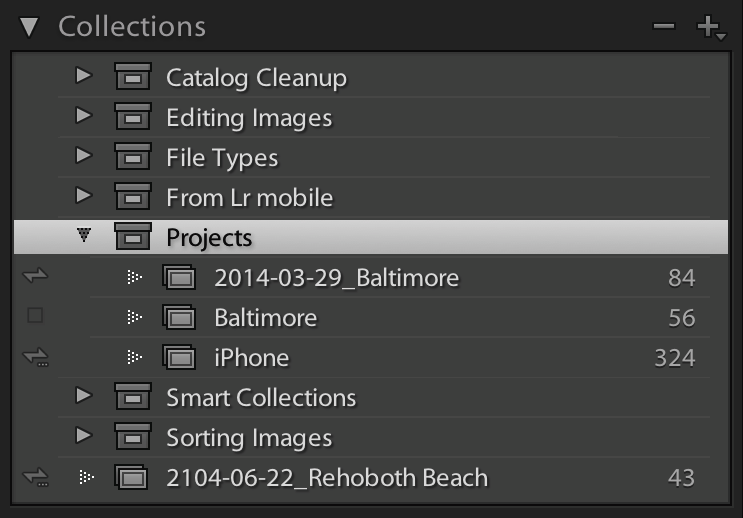 There are two types of collections* in Lightroom: (1) collections and (2) smart collections. See Figure 1. Images are manually added to and removed from a collection (so I sometime refer to these as manual collections). On the other hand, a smart collection is a collection that is populated according to a rule or set of rules and any images that meet the criteria set by the rules existing at the time the smart collection is created or exists in the future are automatically made a part of the collection. The best thing about collections and smart collections is that you can shutdown Lightroom and all your collections and smart collections will be available the next time you open Lightroom with the same catalog. A manual collection is great for a book or other project. 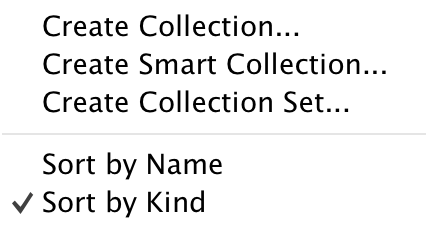 (I also use smart collections frequently and will discuss them in the next blog post.) To use it, simply add all the images for the project to the collection and then, when you want to work on or use those images, go to the Collections panel and highlight that collection. All the images in the collection will be displayed in the image preview area if in Grid View and in the filmstrip. Anything changes made to the images in a collection are actually made to the original image and will be reflect in the view of the image in its original folder. When you are done with the project, it is easy to remove a collection without deleting the images. Figure 3: The Create Collection dialog window for creating “manual” collections. Figure 2: Click on Create Collection to display the Create Collection dialog window (see Figure 3). Figure 4: The Create Collection Set dialog window for creating a “collection set,” which is a folder for organizing collections in a coherent manner. Collections are a great alternative to creating copies of images or creating a handwritten list of images for a project. Using them for projects should increase your productivity and save you a significant amount of time. *There is a third catalog type called a Quick Collection but there is only one per catalog and it is generally used to start a manual collection because, by default, images can be added to it by clicking on the “B” key, i.e., it is the “targeted collection.” While it can be useful at time, I find it better to just create a new collection and populate it directly rather than starting a manual collection as a Quick Collection, saving the Quick Collection as a manual collection, and then clearing the Quick Collection. Editor’s Note: In early May, Brian started a series of ten posts each outlining one or more simple but small things you can do to speed up your Lightroom workflow. This is the seventh post in that series; the first post was about how to efficiently manipulate Lightroom’s interface to reduce clutter; the second about the improving your efficiency inside Lightroom by using context menus; the third about how to name folders; the fourth about how to name image files; the fifth about using keyboard shortcuts; and the sixth about using keywords to quickly find images. 24 Jun	This entry was written by School of Creative Photography and published on June 24, 2014 at 12:28 pm. It’s filed under Editing Images and tagged editing, lightroom, raw. Bookmark the permalink. Follow any comments here with the RSS feed for this post.